Robert Taylor captures the final moments before Colonel Jimmy Doolittle's take-off from the carrier Hornet, just before 8.20am on April 18, 1942. 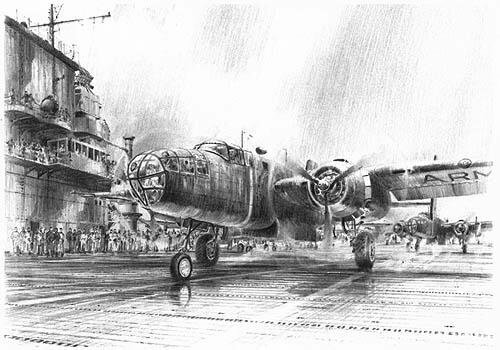 The tension aboard the carrier reaches a crescendo as Doolittle brings the engines to full power, his B-25 straining against the brakes. Within seconds he will hurtle off the deck, followed by 15 intrepid Doolittle Raider crews; their destination, Tokyo. Overall print size: 18" x 14"
All prints are signed by the artist Robert Taylor and numbered.